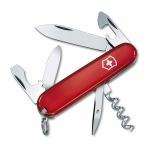 Victorinox was founded in 1884 and is famous for making original Swiss Army Knives. 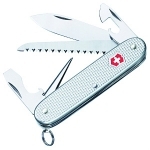 Since it acquired Wenger in 2005 (who also made genuine Swiss Army Knives), it is currently the only supplier of pocket knives to the Swiss Army. Victorinox typically makes knives with a variety of features including different length blades, saws, tweezers, toothpicks, magnifying glasses, pliers, scissors, rulers, cork screws, can openers, screw drivers, files, wire cutters, bottle openers, fish scalers etc. They make ideal boy scout knives as well as pocket knives for every day carry. Below is a chart showing the best Victorinox knives on the site as reviewed by multiple users. Keep in mind that there are many great Victorinox knives out there, but if you can't decide on one after searching the site, choose one off this list and we are confident that you will be happy!